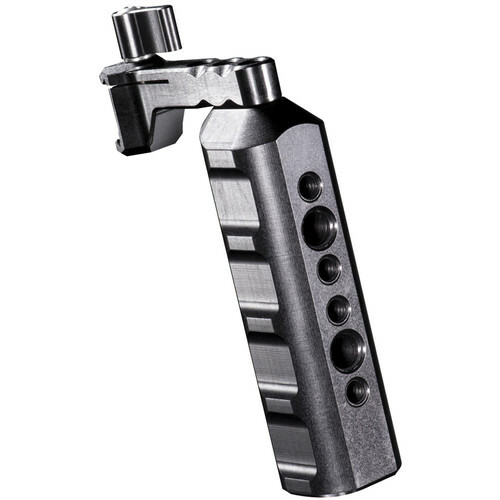 walimex Pro's Aptaris Universal Handle Large is a quick-release rail handle that can be mounted on cages or directly on select cameras. It includes a mini rail bracket that attaches to your device with 1/4"-20 screws, and it slides on and off the rail and secures tight by lever. An L-bracket is also included that allows mounting the handle slightly offset. The handle is ergonomically shaped out of aluminum and provides 1/4"-20 and 3/8"-16 mounting threads all around. Box Dimensions (LxWxH) 5.1 x 4.1 x 1.1"